Trees! 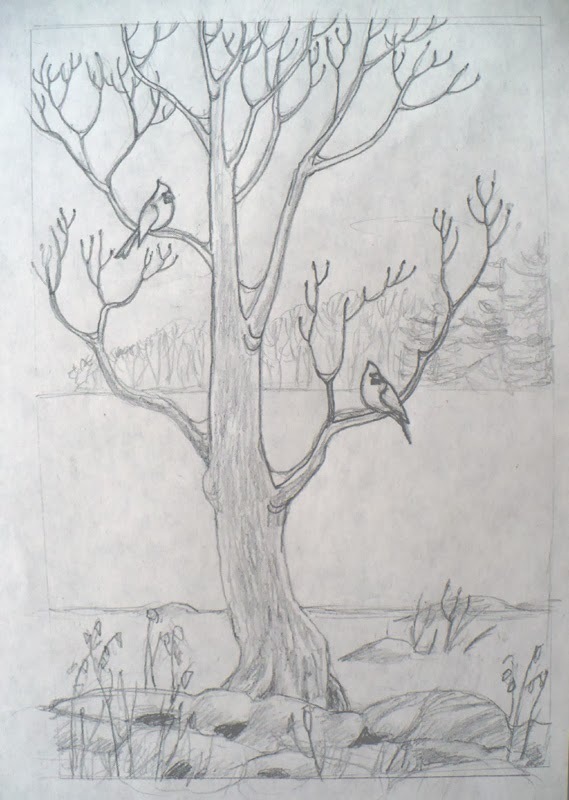 When you've been drawing trees every single day for a month, it's natural that a tree painting will result. Recently I went for a walk by a nearby farm. It was evening and the sun had painted the sky a rosy color beneath deep ultramarine clouds. One lone tree caught my eye. I studied the scene then went home to paint it from memory. 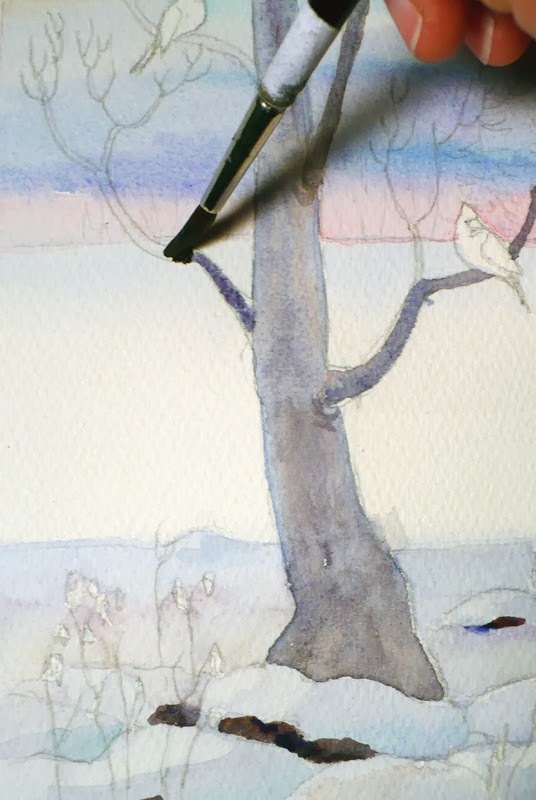 Read on to see how I did this painting, or skip to the finished piece here: The Little Tree watercolor painting. First, I do several drawings of the scene and eventually decide upon this one. Since this is done from memory, I add enough details to help me while painting. 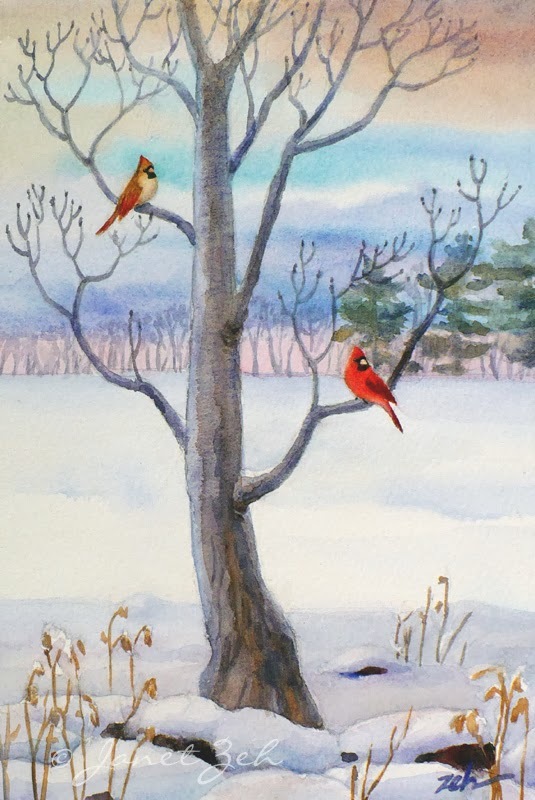 I add a pair of Northern Cardinals since they are so common here. The drawing is then transferred to watercolor paper where the magic of color begins! I begin painting the sky. The lower sky near the horizon was pale rose, above it were deep blue and purple clouds. Above those clouds the sky was a beautiful cerulean blue and above that, more clouds of a peachy color. I like to paint skies wet-into-wet to get soft cloud effects. 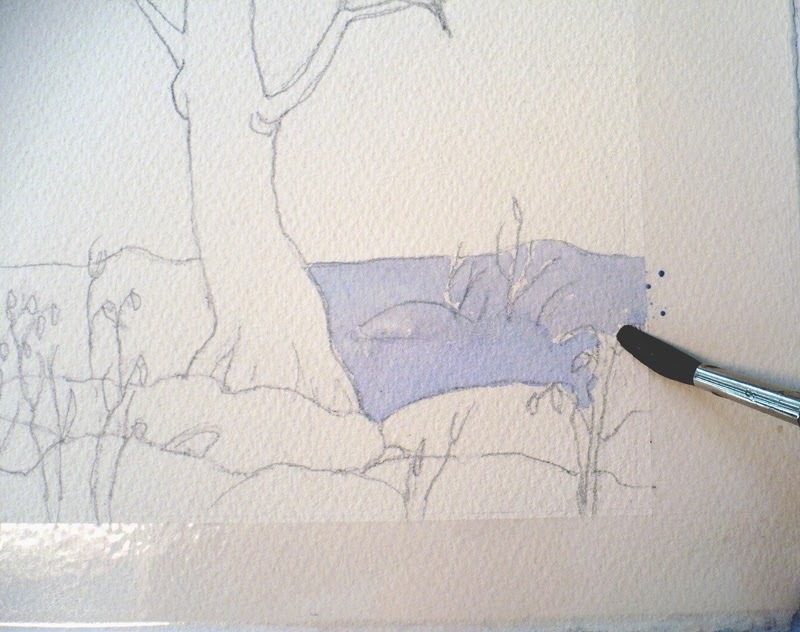 I wet the watercolor paper and add paint, guiding it, but also letting it flow where it will. I find that it's best to just let this be and not touch it too much again. 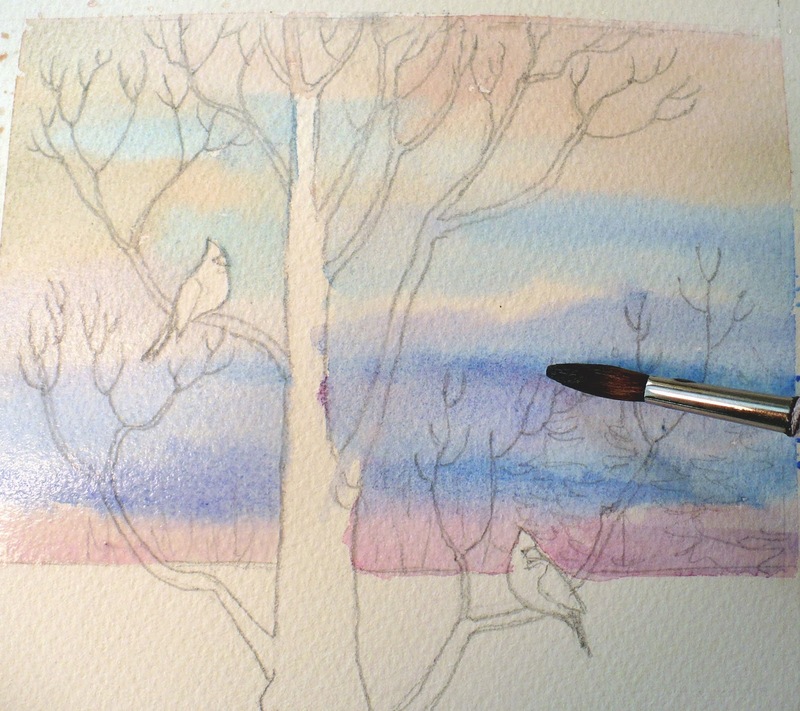 Because the tree branches will be darker, I paint right across them. The tree is next. I mix blue and burnt sienna (russet) paint for a gray tone. Then I wet the tree and branches one by one and drop color into the wet areas. This separates the mix of paint coming off my brush to give a pleasing textured effect. I let the tree dry and add evergreen trees to the background - again wet-into-wet using raw sienna and ultramarine to make green. I also add more details to the snow and foreground. 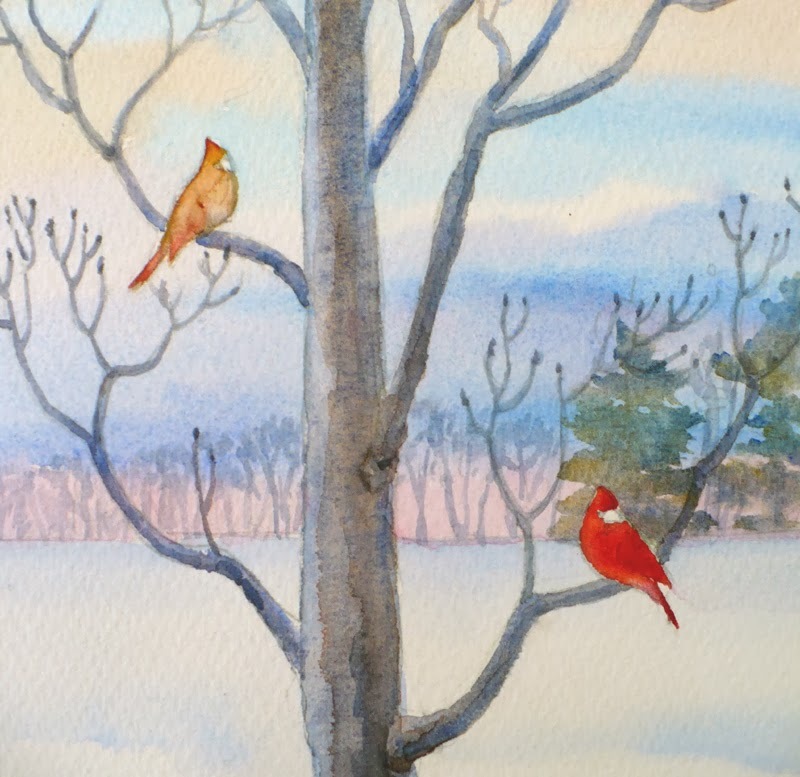 When the initial wash on the tree is dry, I wet the center of it again and paint another more intense wash of blue and burnt sienna keeping the colors separate this time and letting them run together on the paper. The texture lines on the bark are from the paint separating in the first wet wash. I did not have to paint them individually. You can click the image to see this closer. Last, I begin to paint the birds. A female cardinal on the left and a male on the right. When the details of the birds are completed, I add a few strokes to denote bark detail on the very bottom of the tree and the painting is finished. I think it would be fun to paint this tree in the other seasons of the year and perhaps one scene at night. What do you think? This watercolor of the Little Tree has been sold. 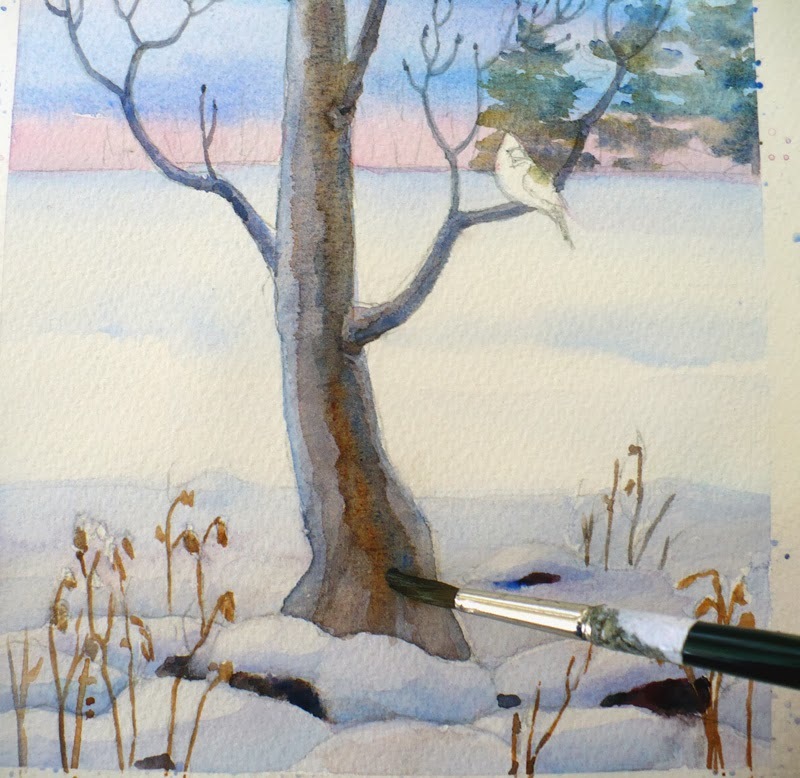 Please contact me if you would like a painting done for you of a tree in winter.